Will CoScripter be to GreaseMonkey what Natural Language was to Lexis/Nexis? I prefer boolean with proximity modifiers, but I will prefer CoScripter. FIFTH STEP: get GreaseMonkey and this UserScript [x] now you’ll have a little grey box top right on every profile with direct links to items like photos, comments, etc. Optionally get Stylish then browse UserStyles.org to make myspace appearance less garish. IMPORTANT: do NOT surf the web in an admin context. Is your windows user in the administrators group? that’s bad. Create a new, ‘limited’ user for web surfing to be ‘safe’. 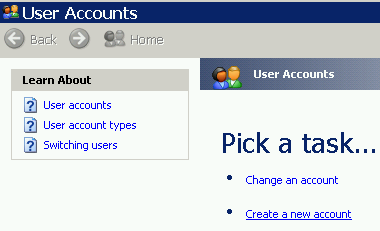 XP: Start, settings, control panel, user accounts. … if you have downgraded to Windows 7 then, masochist, enjoy that. I don’t use google products; this includes gmail. Would you pay to be raped and mugged? Of course not. Don’t use google stuff.. with the exception of Iron, a fork of a google evil plan.